"FLIT-FLIT flapped the flea in the scruffy dog's hair. "AAROOF " howled the stray as he jumped in the air." "AWOOMPH was the sound as he dropped like a sack, landing THUD "OH CRUD " on an old man's back." How can something so tiny cause so much havoc? 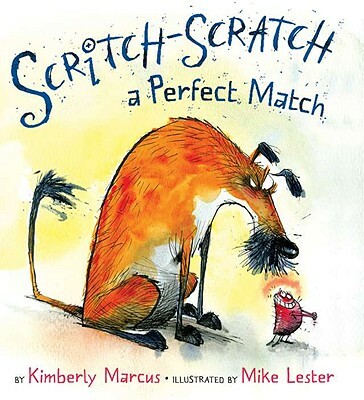 When a flea jumps onto a stray dog, causing the dog to jump on a lonely man, the race is on to find flea powder fast A little itch on a big dog makes for HUGE chaos, but their adventure also leads to a lasting friendship. And when the flea finally jumps from the dog to a stray cat, who jumps onto a lonely lady, the cycle begins anew. Playful language and sound effects and zany, action-packed illustrations make for a surefire story-time hit. Kimberly Marcus is a teacher and teen counselor. She lives in Massachusetts. Mike Lester is an illustrator and political cartoonist who often has cartoons in publications like "Time" magazine. He lives in Rome, Georgia. "[The] book explodes with sound on every page. . . . The galloping, emphatic pace makes the book fun to read aloud. Lester’s cartoons have a frowzy, kinetic appeal that’s particularly apt in a story featuring a scruffy dog." "Illustrated with a great deal of humor. . . In this particular story, which ends mostly happily, the bug has the last bite." "Clever fun and lots of giggles." "Told in crisply scanning anapestic verse and heavily punctuated with onomatopoeic exclamations, this is a madcap friendship story that begs to be read aloud with panache. . . . Abundant motion lines, copious scrawled hatch and crosshatch details, and heaps of sly character humor (the flea has a winning grin, the dog is scruffily endearing) all work together to support the playful text."